Malaysian culture is heavily influenced by that of India, Indonesia, China and the Muslim religion. As such, it can be debated that the country does not have an identity of its own. You also might say that it’s identity is this unique fusion and blend of all these different cultures. What can not be argued is that this convergence of ideologies leads to a very segmented population: especially in Kuala Lumpur. True, we didn’t spend too much time interacting with locals, but everyone we have talked to and the guide books all agree that the country lacks an identity all its own. 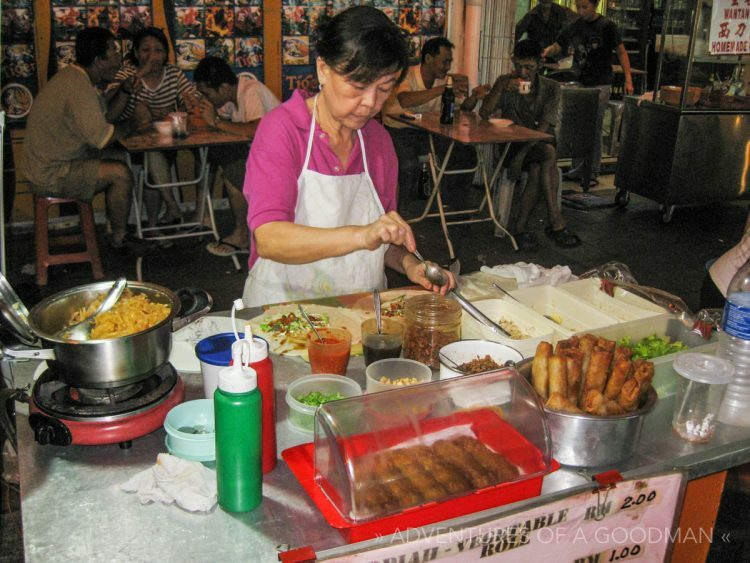 Local dishes of the server’s country are available everywhere, but there is no traditional Malaysian food. Most meals consisted of some sort of noodle and meat, which made life tough for Carrie the vegetarian. The majority of the popular dishes also had some sort of weird brownish sauce on them that absolutely made me gag. I could get it down, but it wasn’t enjoyable. What was enjoyable was all of the pastries everywhere, as Malaysia was filled with things I have never seen before. Most of them were filled with sausage and cheese, though some interesting ones also threw in peas, corn and other varied veggies. That one was gross. Oh, and the cheese had sugar and other sweeteners in it to form a very unique taste. Seafood is also everywhere, though not being a big fan I mostly avoided it. I hate to say it, but the meal we probably had the most was cup of noodles from 7-Eleven. I haven’t had that much Ramen since college!